Here is a list of additional pin mappings not part of the picture above. The default configuration includes those major features. They are all initialized by sys_start() at the startup of the application. Supported drivers for this board. 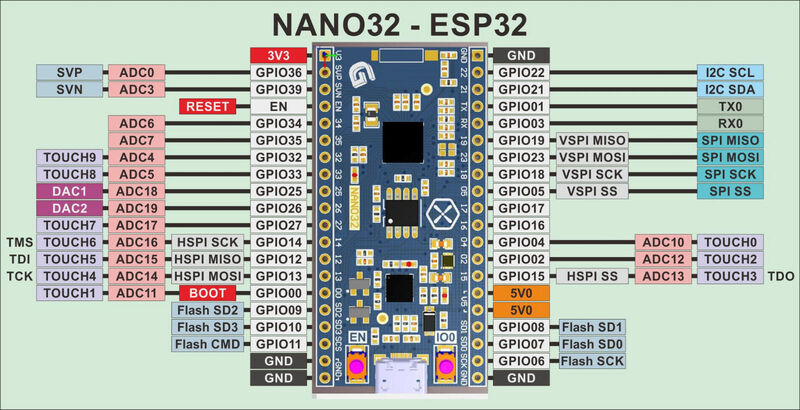 Read more about board specific functionality in the Nano32 module documentation in the Library Reference. The minimal-configuration application is configured to only include the bare minimum of functionality for the low level kernel to run. That is, the thread scheduler and system tick. The default-configuration application is built with the default configuration, including a lot more functionality. See the list of Default system features above for a summary.